Info "When the rabid mutt is looking to the other way, take its bone!" Bone Appetit is a microgame in WarioWare: Smooth Moves. It is located in Ashley's stage. The microgame uses the Discard form. The player must steal the bone picking the Wii Remote when the dog is facing the other side. 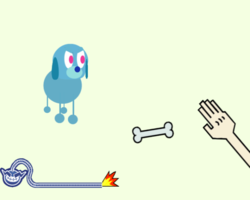 If the player picks up the bone when the dog is facing it, the microgame ends in a loss. The player will also lose if time runs out before they pick up the bone. Also, if the player moves the Wii Remote prior to starting the microgame, the dog will have the bone in his mouth and won't drop it until the player sets the Wii Remote down. 1st level difficulty: The dog walks in circles slowly. 2nd level difficulty: The dog walks in circles faster. 3rd level difficulty: Two dogs walk in circles. The name is a pun on the expression bon appétit, which is a means of telling someone to enjoy his or her meal. It is French for "good appetite." This page was last edited on June 12, 2018, at 21:38.